THE witness box that was used for trials when court hearings were held at Wells Town Hall is one of the more unusual lots being sold at an auction in May. The witness box was made for the Wells court in the 1960s by Gordon Allen of building firm GC Allen. It is now owned by his son Jeffrey, who has restored it and is selling it along with thousands of other items in a retirement auction. “I think it’s lovely but what am I going to do with it?” said Jeffrey. Other auction highlights include several old pub signs, including one for The Globe Inn and two for The Fountain Inn, one of which was never hung. “The landlord took one look at it and said ‘I’m not having that outside my pub’,” said Jeffrey, who hopes to sell the signs for a good price. There is also a pub sign for the long-gone New Inn in St Thomas Street. “That was probably the last sign and it was taken down when it closed,” Jeffrey said. Gordon and his wife Elsie started GC Allen as a building and flooring contractor in 1957, first working out of a lock-up in the Fountain Inn car park, then relocating to Mill Street in 1960. Jeffrey joined the firm in 1972, doing his apprenticeship in carpentry, and took over the running of the firm in 1983 after Gordon broke his back in an accident. More listed building work ensued, including building The Black Dog in Tor Street for Kennedy and Phillipa Collins. When Gordon died, the firm moved to the present site at Harters Hill, Coxley, and the Mill Street premises were converted into retail units. A wool shop and Wells Antique Centre are now based there. 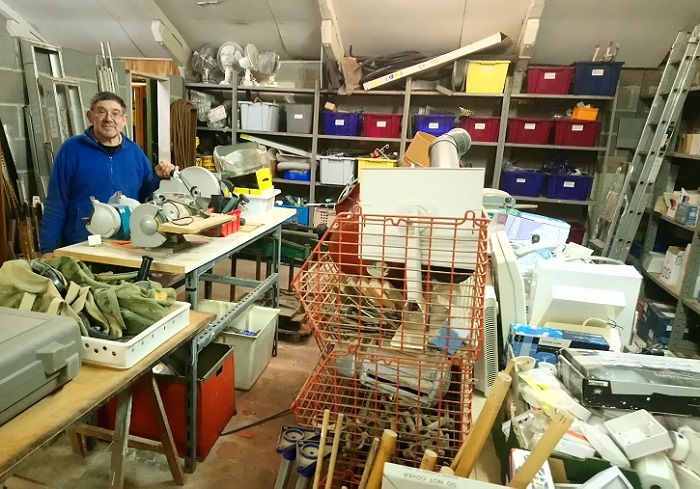 Robert Packer, the last and longest serving staff member, retired after 40 years and though Jeffrey carried on doing smaller jobs, he now feels it is time to clear away years of accumulated materials and memories. More than 600 lots with a guide price ranging from £1 to more than £500 will go under the hammer at the auction at the Coxley warehouse and yard on Saturday, May 4, at 10.30am. Lots range from the saw Jeffrey’s parents bought in 1960, that is still going strong, to strips of maple wood left over from the last skittle alley that Allen’s laid with maple, before a shift to beech. “It’s an eclectic mix. There’s something for everybody here,” said Jeffrey.